Shredder. Photograph by Ken Smith. Little Rufus, red-shouldered hawk, went back to Second Chance on Monday, January 9th to undergo major surgery to remove his damaged left eye and the seal the lids permanently. 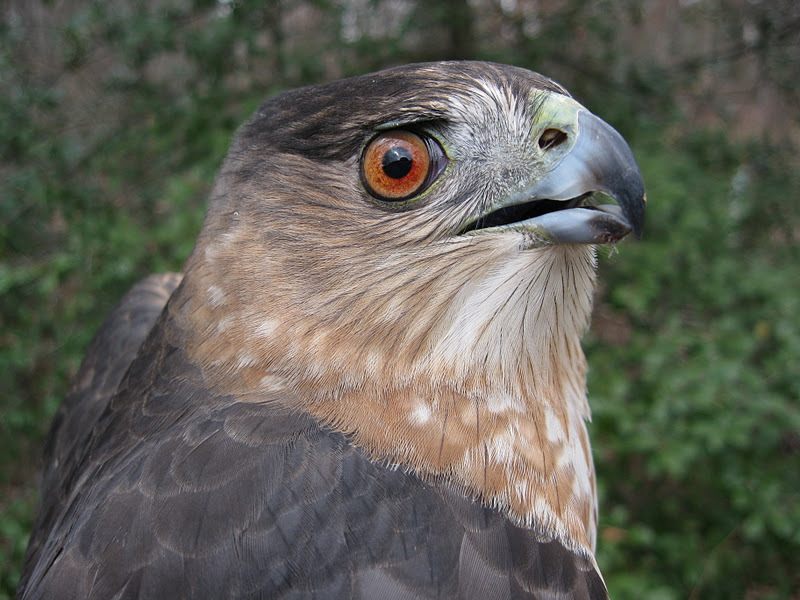 A hawk’s eyes are much larger than they appear on the outside, so this was no simple task. Dr. Pat conducted the grueling 2-hour operation with the assistance of Kathleen Handley, at no charge. 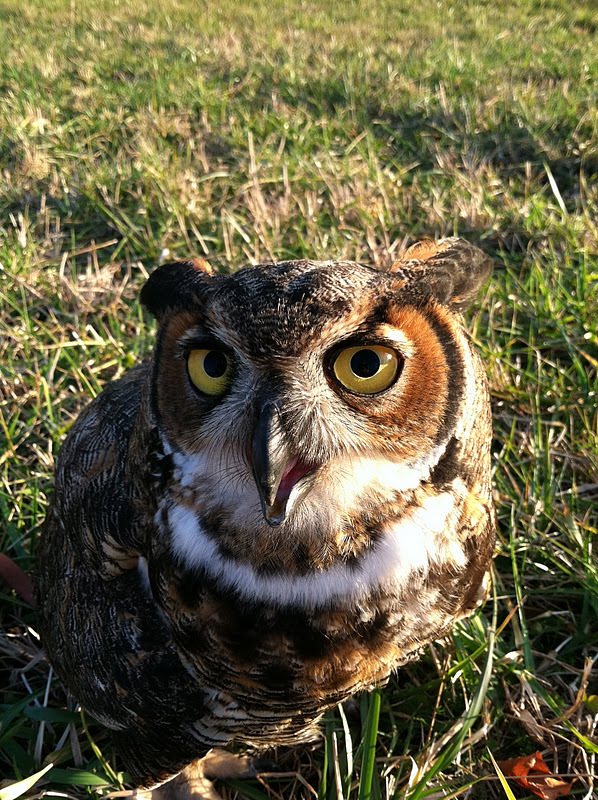 Rufus spent the rest of the week recuperating indoors, first at Second Chance, and then at Owl Moon. His recovery went smoothly, and by Tuesday this week he was feisty and ready to return to the red-shoulder mews. He appears relieved to be back outside with the others. Pasadena, the juvenile female red-shoulder with the fractured right ulna, is doing great. Her wing has recovered much of the range of motion it lost, and we began creance flying her last Friday, January 6th. After only three sessions, she is flying as if nothing ever happened to her wing, so I am confident that she will be able to return to her hometown in another week or two. At this point I just want to be sure the bone is fully healed and that she is in top physical condition before going back to the wild. Soldier-girl is still having difficulties with her left leg and foot, lingering consequences of a nasty compound fracture of the tibiotarsus and fibula. She bears weight on the leg sporadically. The opposing toe, or hallux, is still apt to fold under the foot when she perches. I tried applying an inter-digital wrap on the foot to keep the hallux back where it belongs, but that was not enough. Today I went a step further and applied a “ball bandage,” which is certain to keep the hallux back, but makes perching more difficult. It is basically a ball of gauze placed in the grip of the foot. The foot is then wrapped to hold the gauze in place. The ball bandage forces her to bear most of her weight on the right foot, which she does anyway. The healthy foot is prone to pressure sores from constantly bearing all her weight, so I applied padding and an inter-digital wrap on that foot as well to protect it. 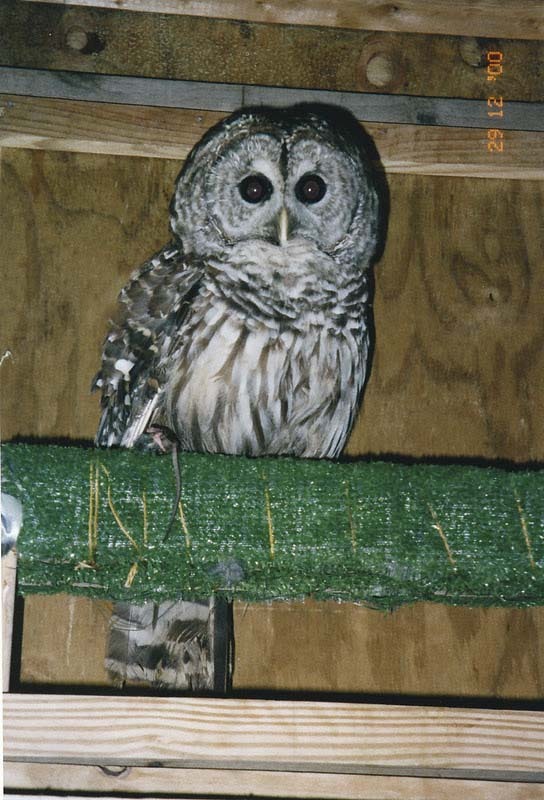 The perches in her mew are doubled (two perches aligned closely parallel) and padded to give her more surface on which to land and keep her balance, and to allow her to lie down and rest both legs, which she often does at night. We cannot be sure that these efforts will succeed in the long run, but we want to give Soldier-girl every chance. Meanwhile Squeak-toy hangs out with the others, and though we are not working with, or on, him these days, he made progress on his own initiative. After three weeks of sticking to the lowest perch in the mew, Squeak-toy discovered, all by himself, that he could fly to the next highest perch! Now THIS perch has become his favorite, though he is willing to share. 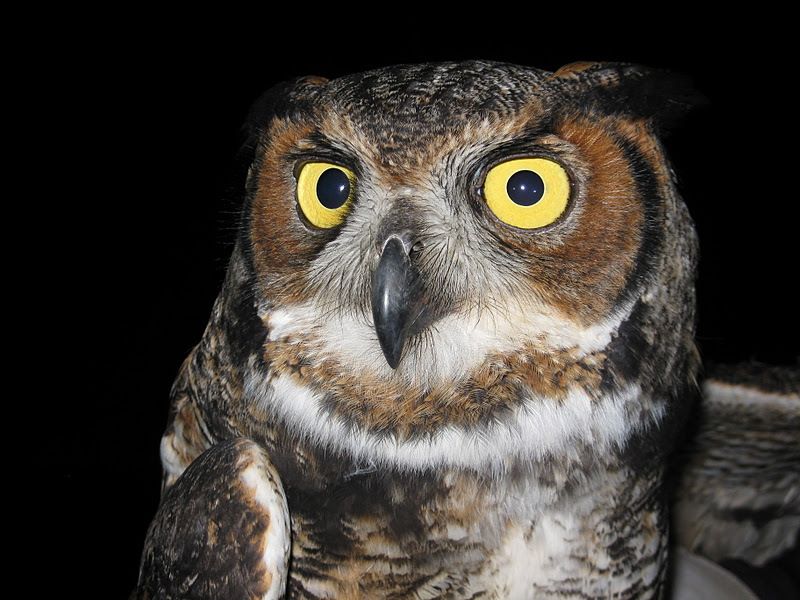 Finally, it is with great pleasure that I announce Shredder, the great-horned owl, is back in his native woods. His release day came on Sunday, January 8, 2012. We gave him quite a send-off too! I invited Jim and Maureen, the nice couple who rescued Grace, to attend the big event. They live just up the road from Shredder’s home turf in Middletown, MD. Ken came to band Shredder before release. He brought two friends, Jonna and her daughter Juliana, to witness the event. Zoe, who found Shredder, and her neighbor were also present. We met just before dusk. I hoped to get a parting shot of Shredder with a full moon rising but it became too dark too fast. Shredder made a beeline for the trees. He stopped briefly on a pole to scope out his options, and then continued into the darkness. Farewell Shredder! We hope we got you home in time to reunite with your mate and have a successful nesting season! 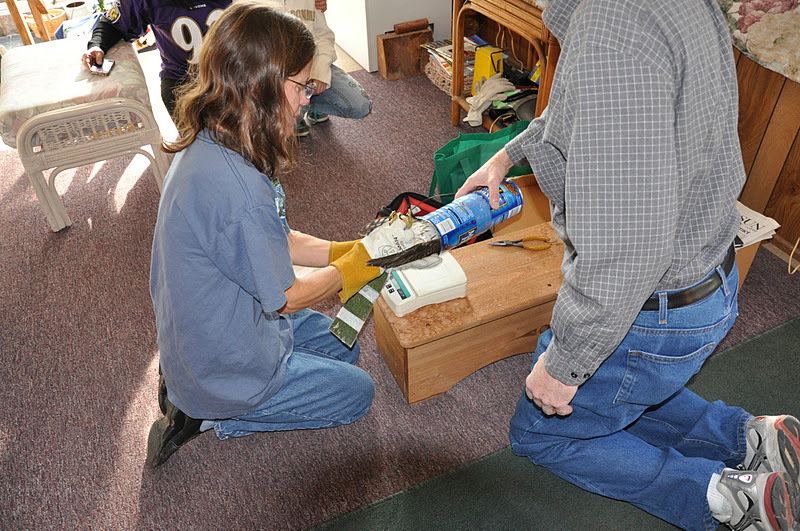 Suzanne Shoemaker holds Shredder prior to his release. Photograph by Ken Smith. Cooper sitting in the rafters at Sam's Club. Photography by Pat Gilbert. 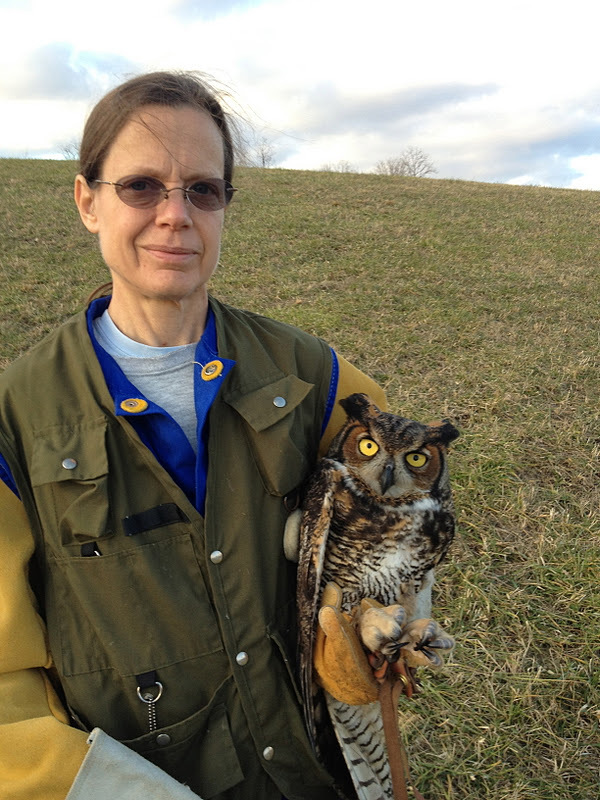 I received a call from my friend and fellow rehabber, Judy Holzman of All Creatures Great and Small Wildlife Center in Columbia, MD. Judy had just spoken to Pat, who manages a Sam’s Club in Baltimore. 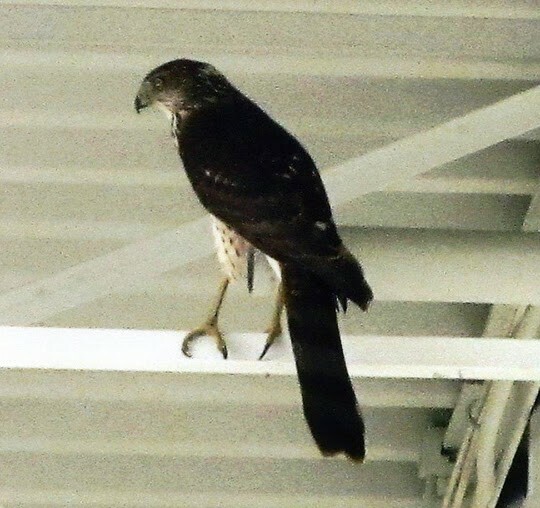 She and her co-workers had discovered a hawk flying about high in the rafters of the superstore. Pat knew the bird was in trouble, as there was no hawk food in the store and no easy way out for the bird. Judy and I both knew that it was most likely a Cooper’s hawk. 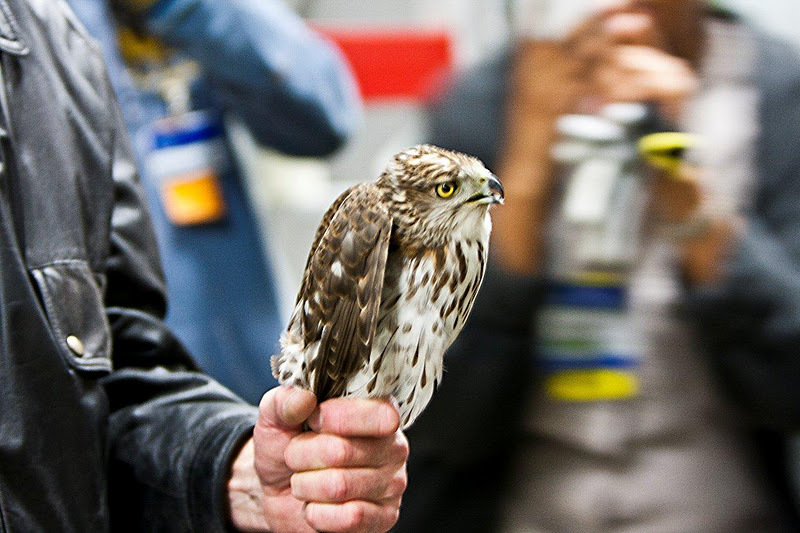 Cooper’s hawks are bird hunters, and prone to getting trapped in warehouses and other large buildings. They fly in chasing their prey, such as house sparrows and starlings, which sometimes seek food and shelter in such places. You have probably seen these smaller birds flying around in your local Home Depot or other superstore. The hawk flies in chasing it’s prey, but once inside it gets spooked and flies high into the rafters seeking safety. Unfortunately most of these buildings have skylights, but no openings in the roof. The exits are close to the ground, and the hawk won’t fly down to where it would find its escape, not without something to lure it down. 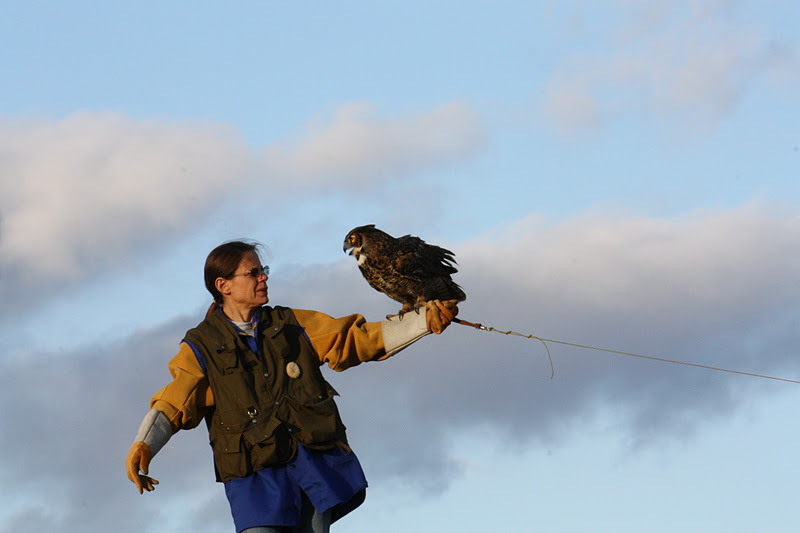 In this matter, rehabbers often enlist the help of falconers or raptor banders, who have the equipment needed to lure and capture hawks. I called Ken Smith, a raptor bander who has helped me before with such cases. Ken has a number of hawk traps, including a Bal Chatri (a.k.a. BC). This trap is basically a small welded-wire cage with a weighted base and loops of monofilament fishing line tied all over the outside. A live pigeon, starling, sparrow, or mouse is placed inside the cage, which protects it from the hawk. The trap is placed below the hungry hawk and, if possible, on a surface above the floor such as a high shelf (so the hawk will feel safe approaching it), or on the floor near an open exit (so it has the option to keep flying through the exit). 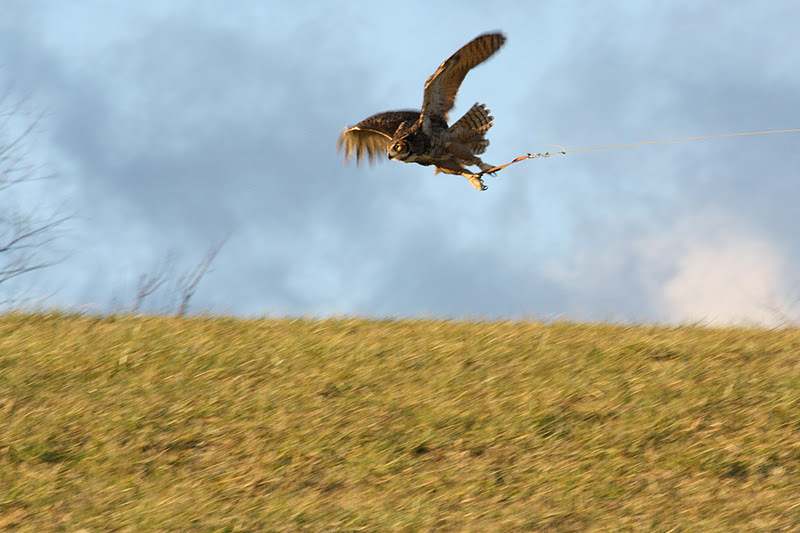 When the hawk lands on the trap, its feet become caught in the monofilament loops and it can’t fly away. Judy, Ken and I arrived at Sam’s Club at 8 pm, a half-hour before closing, and met Janice, the night manager, who kindly walked us through the aisles to where the hawk was perching, over the store bakery. Fortunately, this was also near the large freezers, which had a good solid roof, and a ladder that reached the top. This made an ideal set-up. We could anchor the trap on the freezer roof, which was close enough to the hawk that it would spot it (but not spook when we placed it there), and high enough above the workers who were restocking shelves, that the hawk would feel safe in approaching it. The plan was implemented! We set the trap on top of the freezer where we could observe it from the ground, and then climbed down and watched at a distance with our binoculars. We had prepared for a long evening of waiting, but it took only about 20 minutes before the hawk landed on the trap. , Once we were sure his feet were entangled Ken and I rushed to the ladder and climbed to the hawk. Ken got a hold on his feet and we untangled him from the trap. When we reached the ground with the hawk, Pat, the store manager was there with her camera, and a number of employees were snapping pictures with their cell phones. They were excited to see “Cooper” the hawk, whom they had proudly named after identifying his species. A quick examination revealed that Cooper, a juvenile male, was dehydrated and in need a couple of days of fluids and food before being turned loose. So we tucked him in a box and I took him home to Owl Moon Raptor Center. 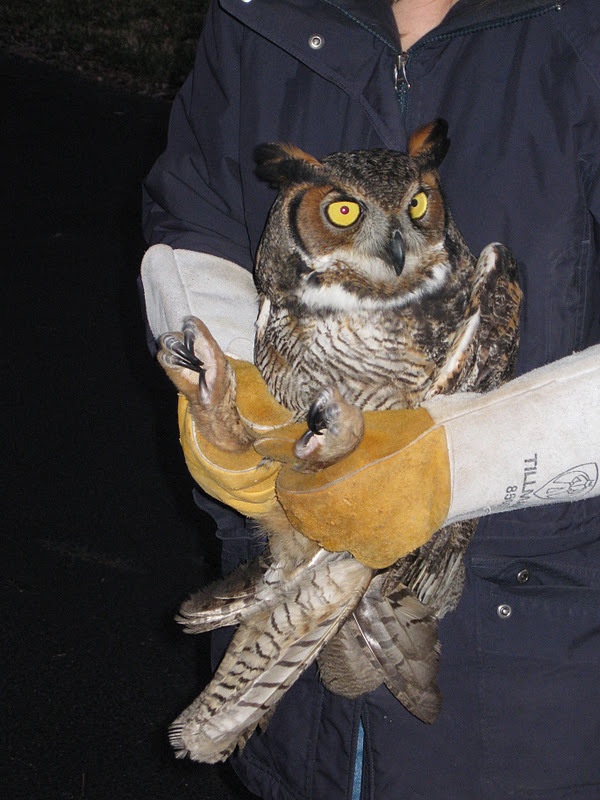 As expected, Cooper recovered quickly, and he was ready for release on Sunday; New Years Day. Though I normally release birds back in their home territory, I was reluctant to send Cooper back to his urban home, with all of its traffic hazards and the very real chance of him winding up in another superstore or warehouse. A juvenile hawk has not mated or established a nesting territory in its first winter, so it is not a major disruption to move them. 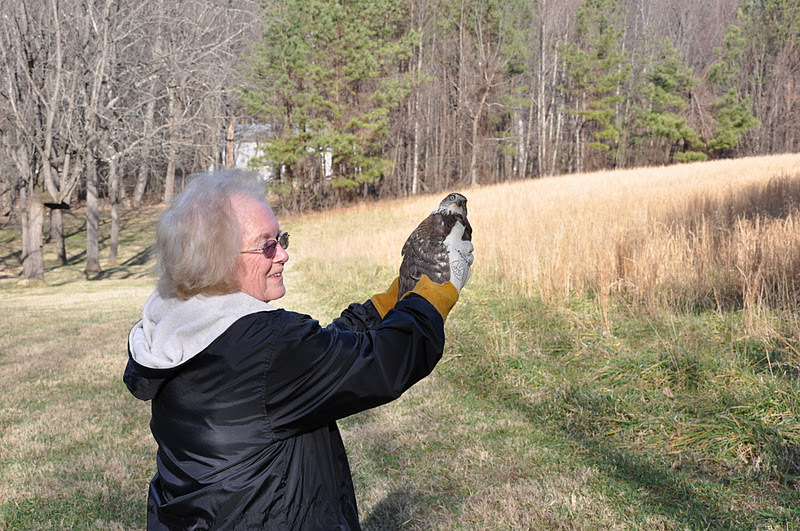 We decided to release Cooper in rural Ellicott City, where Shayne, a friend of Ken’s, has several acres of prime Cooper’s hawk habitat: a stream, meadows, and tall trees. I met Ken there, and after Ken banded Cooper, Shayne’s mother was given the honor of releasing him. He flew straight through a bamboo thicket and kept on going! 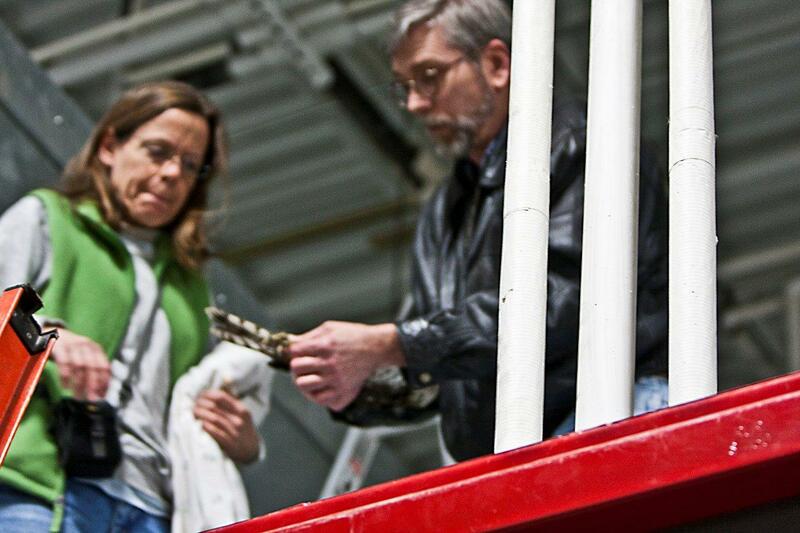 Suzanne Shoemaker and Ken Smith remove Cooper from the trap. Photograph by Pat Gilbert. Sam's Club staff gather around to see Cooper after he is safely removed from the trap. Photograph by Pat Gilbert. Cooper's head is covered with a can to keep him calm while Suzanne Shoemaker and Ken Smith band, weigh and measure him before release. Photograph by Shayne Twigg. Carolyn Twigg prepares to release Cooper. Photograph by Shayne Twigg.